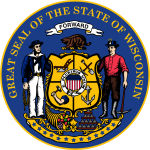 The Wisconsin general elections, 2018 were held in the U.S. state of Wisconsin on November 6, 2018. All of Wisconsin's executive officers were up for election as well as one of Wisconsin's U.S. Senate seats and Wisconsin's eight seats in the United States House of Representatives. The Democrats swept all of the statewide offices held by the Republicans. Incumbent Democrat Tammy Baldwin, first elected in 2012, won re-election to a second term in a landslide by a 11 percentage point margin. All all 8 of Wisconsin's congressional districts up for election in November. No seats flipped in the election, with Republicans continuing to hold 5 of the state's house seats to the Democrats' 3. Incumbent Republican Governor Scott Walker, first elected in 2010, sought re-election to a third term, but was defeated by Democrat Tony Evers. Potential Democratic candidates include former State Senator Timothy Cullen, Former Dane County Executive Kathleen Falk, Jefferson County District Attorney Susan Happ, U.S. Representative Ron Kind, Kenosha County Executive James Kreuser, State Representative Cory Mason, Blue Jean Nation founder Mike McCabe, Outagamie County Executive Tom Nelson, Dane County Executive Joe Parisi, State Representative Chris Taylor, State Senator Kathleen Vinehout, and State Representative Dana Wachs. 2016 Libertarian candidate for U.S. Senate Phil Anderson has declared his candidacy. Republican incumbent Brad Schimel, first elected in 2014, ran for re-election to a second term. Voting rights attorney and former federal prosecutor Josh Kaul, the Democratic nominee, defeated Schimel in the general election. Incumbent Democrat Doug La Follette, first elected in 1982 (and also serving from 1975–1979), won re-election to a tenth non-consecutive term. Madison Alderwoman Arvina Martin challenged La Follette in the Democratic primary. Jay Schroeder was nominated in the Republican primary to run against La Follette, pledging to abolish the position if elected. Libertarian sports announcer Rich Reynolds declared his candidacy for the position as well, joining the "TeamGuv" bill with Phil Anderson and Patrick Baird. Incumbent Republican Matt Adamczyk, first elected in 2014, chose not to run for reelection. Sarah Godlewski, the Democratic nominee, defeated Republican Travis Hartwig in the general. The 17 odd-numbered districts out of 33 seats in the Wisconsin Senate were up for election in 2018, with Republicans holding 11 of the seats and Democrats 6. Both parties held all their seats. All 99 seats in the Wisconsin State Assembly were up for election in 2018. Republicans lost one seat to the Democrats, resulting a 63-36 seat Republican majority. ^ a b c d e Opoien, Jessie (July 3, 2016). "7 Democrats who might challenge Scott Walker in 2018". The Capital Times. Retrieved July 5, 2016. ^ Johnson, Shawn (July 5, 2016). "Former State Sen. Tim Cullen Considering Run For Governor". Wisconsin Public Radio. Retrieved July 6, 2016. ^ a b c d e f g h Opoien, Jessie (August 10, 2016). "Turning the tide: Can a Wisconsin Democrat win the 2018 election for governor?". The Capital Times. Retrieved October 5, 2016. ^ Kampa, Dana (October 20, 2016). "Professors outline possibilities for future gubernatorial elections". The Badger Herald. Retrieved October 31, 2016. ^ a b c d Sommerhauser, Mark (June 5, 2016). "Kathleen Vinehout surveys Democrats about run for governor". Wisconsin State Journal. Retrieved July 5, 2016. ^ Bauer, Scott (May 4, 2017). "McCabe: 'I am willing' to run for Wisconsin governor". Milwaukee Journal Sentinel. Retrieved May 15, 2017. ^ Becker, Abigail (June 6, 2016). "Stressing access for all, Dane County Executive Joe Parisi to run for re-election". The Capital Times. Retrieved July 5, 2016. ^ Marley, Patrick (November 6, 2018). "Tony Evers denies Scott Walker a third term as Wisconsin's governor". Milwaukee Journal Sentinel. Retrieved December 3, 2018. ^ Marley, Patrick (November 7, 2018). "Mandela Barnes To Become First African-American Lieutenant Governor". Wisconsin Public Radio. Retrieved December 3, 2018. ^ DeFour, Matthew (May 14, 2016). "Glenn Grothman cites transgender bathroom legal battle as sign of 'moral decline'". Racine Journal Times. Retrieved November 4, 2016. ^ Beck, Molly (November 7, 2018). "Josh Kaul declares victory over Brad Schimel in attorney general's race". Milwaukee Journal Sentinel. ^ "Schroeder Campaign:Eliminate Secretary of State Position" (PDF). February 19, 2018. Retrieved February 24, 2019.